After breakfast, we will drive to the start point of our trek. We head south into the foothills of the Atlas. Our route follows the picturesque Zat Valley as far as the village of Arba Tighedouine (800m) where we meet our muleteers and trekking team. From the town we start our trek, heading along the broad valley towards the village of Talatast which is reknown for its pottery. Beyond this traditional Berber settlement, the valley narrows and fields become terraced. We pass walnut groves as we make our way to our overnight camp at the village of Aït Stimane at 1200m. Today we will walk on to the Yagour Plateau, trekking through sparse forest of juniper and oak, with good views up-valley of Bou Oughiwl and Aghoujdid. 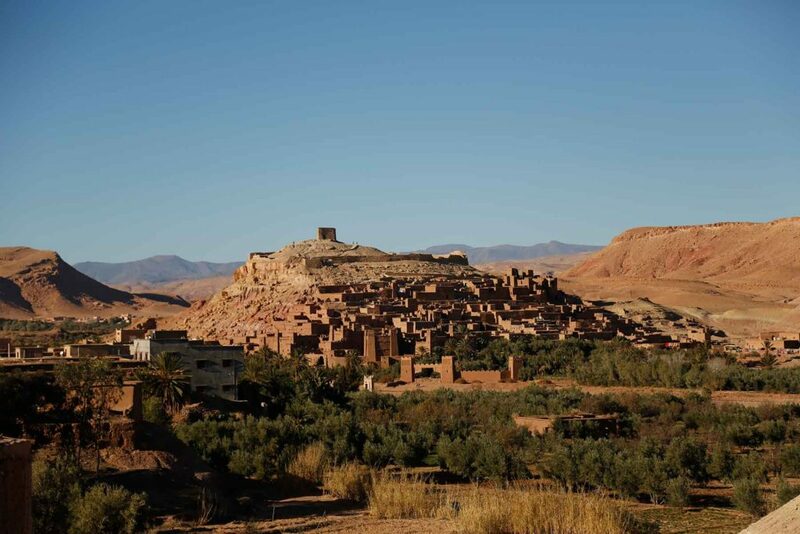 The village of Ouarzazt is considered the gateway to the Yagour Plateau, and beyond its terraced fields of corn we climb into a desert world of red and yellow rock. This area is well-known for petroglyphs (rock carvings) and we will be able to see some of the best examples. We camp at Yagour Plateau at 2300m. After breakfast we cross the plateau we traverse alpine meadows and traditional grazing areas to reach a wonderful terrace giving fantastic views over the Ourika Valley. We now descend more than 1000m to reach the bustling village of Setti Fatma, which is both a pilgrimage sight and a popular holiday resort. We take our lunch beside the river in the welcome shade of some poplar trees. In the afternoon we continue our trek towards the gorge of the Ourika and set up camp among the terraces of the Berber village of Agadir Aït Boulmane where we will camp for the night at 1500m. We start the day following a mule track through this beautiful valley and passing the little visited villages of Tamatert and Amenzel. We climb to the foot of the Tizi Boukchoud pass and will camp here at 2500m. The first thing we will do today is making the 470m climb to the Tizi Boukchoud (2976m). From the col we are treated to a superb view of the northeastern ridges of the Toubkal massif. Descending from the pass we enter the gorge of the Tifnoute river and on to Adouz (2700m) at the foot of our first peak, Adrar n’Dern. Today we start early for the traverse of Adrar n’Dern. The climb to the highest point of this peak at 4001m provides terefic views of the surrounding ranges and valleys. 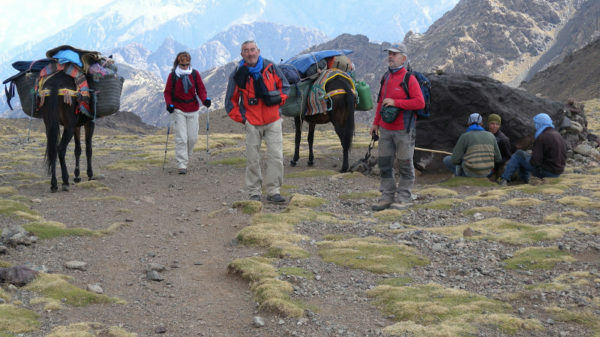 From the summit we follow the ridge southwest and descend to the head of the Tinzart valley where we will camp near Tizi Ourai at 3000m. Today we’ll have a shorter day and mostly downhill after 30 minutes when we climb to the col of Tizi n’Ourai. From here there are great views of Toubkal and the distant Anti Atlas. Dropping down on a descending mule trail we pass high above several small villages. Tonight we will stay in a basic gite in the Berber village of Amsouzart at 1740m. Leaving Amsouzart we climb steadily through this green and pleasant valley. Above the village of Ait Igrane the path begins to climb more steeply and after a long series of zig-zags over moraine boulders we are confronted by the breathtaking sight of Lake Ifni, the biggest lake in the central part of the Atlas. We take a path which traverses high above the north side of the lake to reach its western end where we take our lunch. Above the lake, we follow the upper valley of the Assif a Moursaine climbing steeply through the mouth of a gorge to reach crude tent platforms at a stream confluence around 2700 m.
After breakfast we start walking again to one of the most spectacular pass crossings in the Atlas, the Tizi-n-Ouanoums at 3650m.This is a long climb of 3 to 4 hours to reach this rocky col, situated between the two highest peaks in the Atlas: Toubkal and Ouanoukrim. 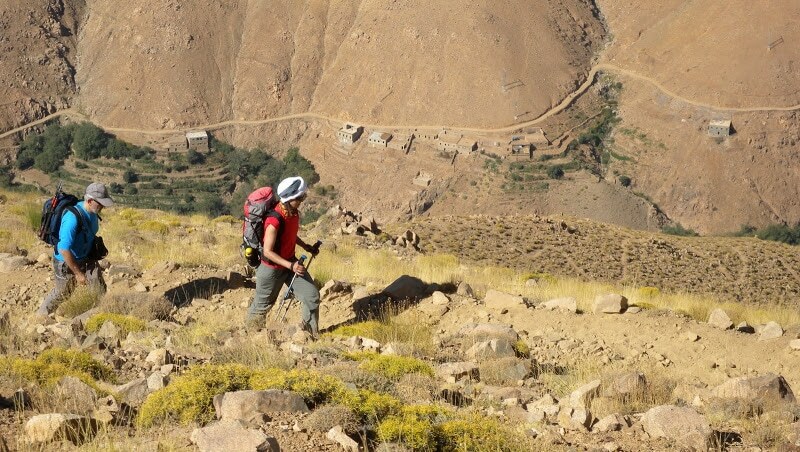 We turn west below the pass and traverse across scree slopes to reach the Tizi Ouagane from where we start the climb to Ouanoukrim at 4088m. On this ascent there are some rocky scrambling sections which are straightforward but require a hands-on approach. From the top, the views of Toubkal and the surrounding mountains are spectacular. We start our descent to the refuge at 3206m where we will spend the night camping. Early in the morning we make our attempt on the summit of Jebel Toukbal, the highest peak in Northern Africa. Our route takes us up the south cirque, crossing the stream above the refuge. The walking is relatively straightforward, but the scree and the altitude will make the going quite difficult in parts. The views along the way make the journey more than worthwhile. When you reach the the summit you will see that the vistas across the surrounding landscape are quite breathtaking. From here there are unrestricted views in every direction, from the Marrakesh Plain to the High Atlas in the north and as far south as the Anti-Atlas and the Sahara. We will retrace our steps when we return down the mountain and spend the night at the camp nearby the refuge again. Today we start with an ascent to Tizi Tadat at 3800m where we get a superb view of yesterday’s route on Toubkal. For those who wish there is now the opportunity to bag our fourth 4000er of the trip. To reach the summit of Bouguinoussen (4025m) we climb from the col along a rocky ridge. 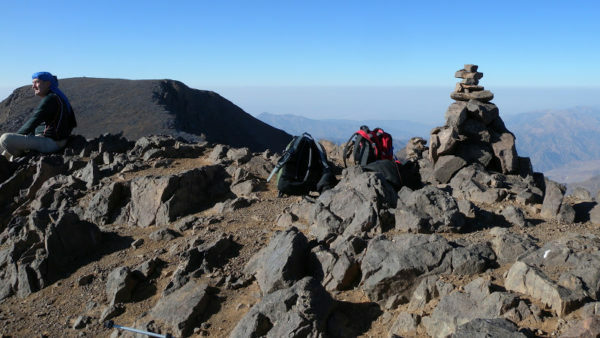 The route up to this summit is the most technical of the trek and does involve more scrambling than the previous peaks and the leader will go through the route and summit attempt, which is optional. We return by the same route, a round trip of about 2 hours. From the col of the Tizi Tadat we descend first to the Tazarat refuge and then follow the assif Melloul down to our last camp at Tamsoulte at 2300m. The final climb of this mountain odyssey takes us across the Tizi Mzik covered in Junipers with the reward of a magnificent view across to the summit of Ouanoukrim and over the beautiful valley of Imlil. 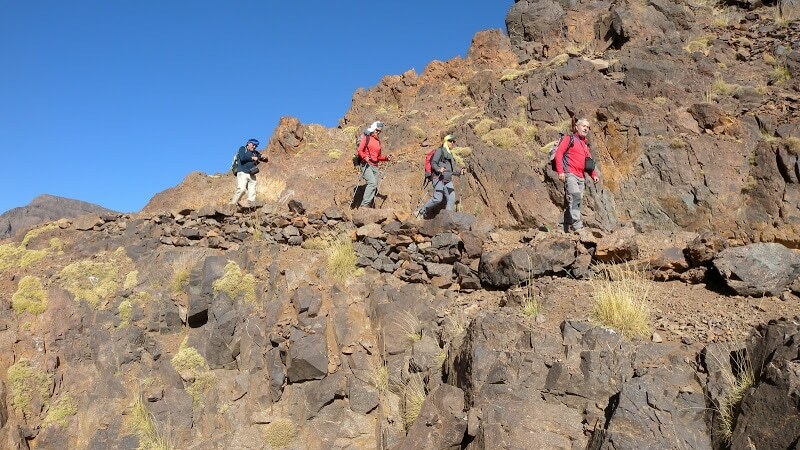 We descend on a good trail to reach Imlil from where you will transfer back to Marrakech. Free day in Marrakech. The city’s dazzling centre, the Djemaa el Fna square, is an enthralling and exotic Eastern experience populated by snake-charmers, acrobats and storytellers. You’ll be able to have a meal at one of the small food stalls that appear only at night to serve up delicious kebabs, seafood, soup and salads. You’ll explore the medieval medina and markets heaving with a colourful mixture of bright carpets, piled fruit and dyed skeins of wool. Behind small gates you will discover handsomely-wrought sultan’s tombs, ancient palaces and Koranic schools. The numerous terraces are great for people-watching and, in the evening, a refreshing visit to a steamy hammam (a Turkish bath) is recommended. Transfer back to Marrakech Airport and fly back home.